Milxed Millets Karapaniyaram / Siru Dhaniya Karapaniyaram is a tasty and spongy South Indian breakfast / snack variety. 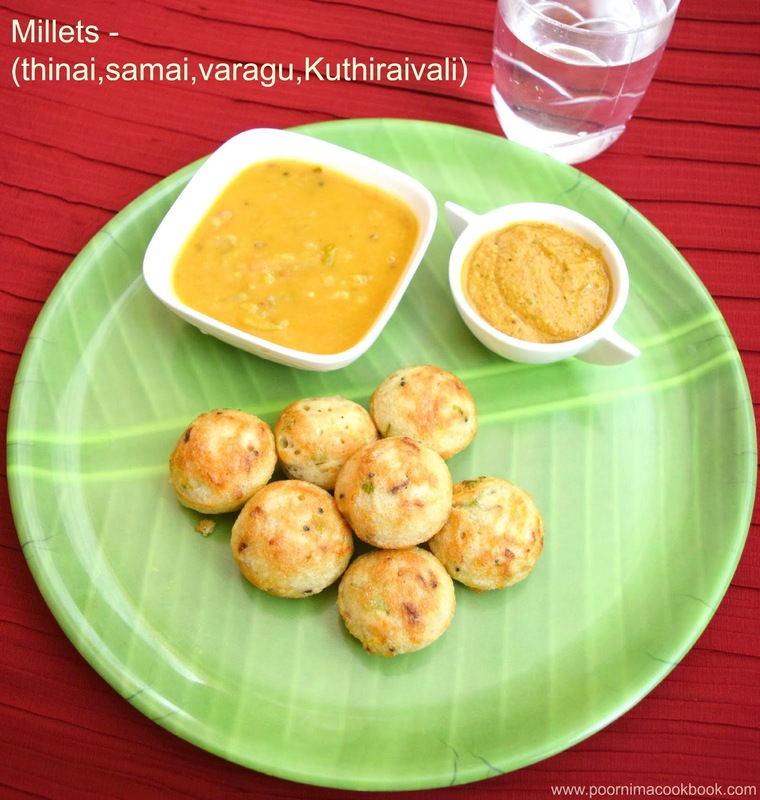 Usually spicy paniyaram is prepared using rice and urad dhal mixture; instead I have tried using four types of millets Samai - Little millet, Thinai - Foxtail millet, Kuthiraivali - Barnyard millet, Varagu - Kodo millet, Urad dhal with some seasonings to prepare this recipe. The outcome was good; try this and include in your daily routine for a healthy living! I started to include millets in many of my recipes, especially breakfast (eg: Idly, dosa, pongal, paniyaram, etc. 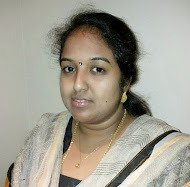 ), avoiding or limiting the rice quantity after knowing about the health benefits of millets. Thanks to my friend Lakshmi Krishnamoorthy from whom I learnt this. 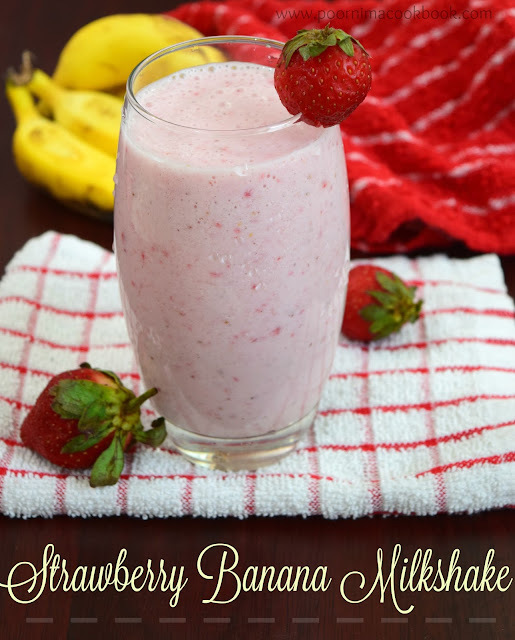 Do check my other millet recipes! Wash and soak all the four millets, urad dhal and fenugreek seeds in water in nearly 3 to 4 hours. Heat oil in a kadai; add mustard seeds and urad dhal. After it crackles, add chopped onions, green chillies, grated carrot, salt and curry leaves. Fry till onions become translucent. Once it is done; add the seasoning mixture into the batter. Give it a mix. Heat the kuzhipaniyaram pan; add 1 to 2 tsp oil or ghee into each hole. Pour batter in all the holes and close the pan with a lid; allow to cook in medium flame. Turn on the other side using a tooth pick or a stick. Allow to cook till the other side turns golden brown. 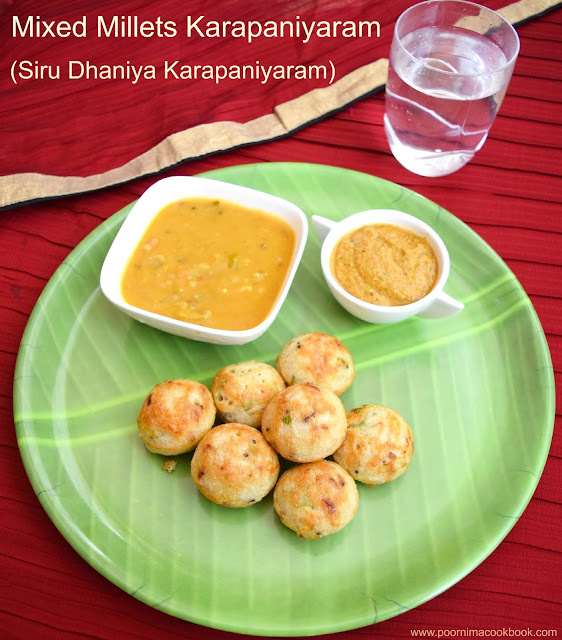 You can also try this paniyaram using only two types of millets in 1: 1 proportion. If you want to include rice; skip any of the millets and try. Don't skip onions, it is the main ingredient which gives nice taste and crunchiness to this recipe. 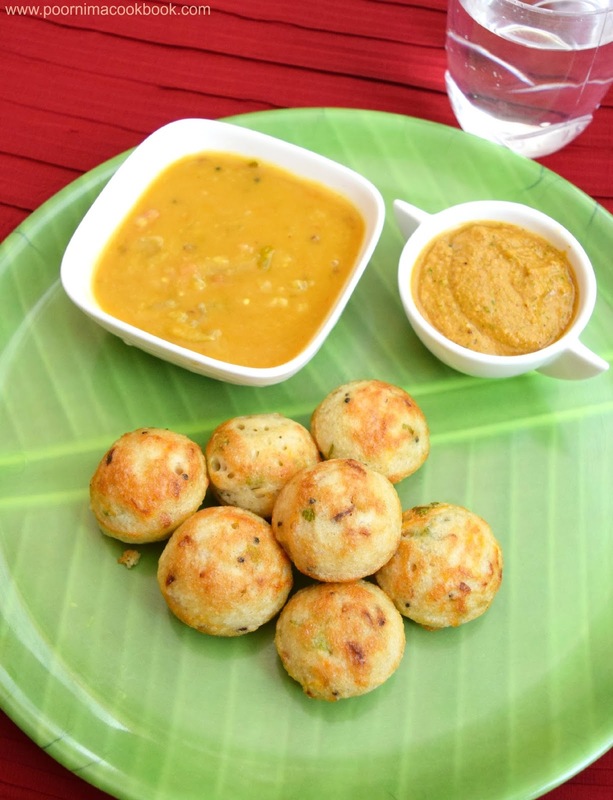 Millets batter tend to ferment fast than our normal idli batter; check it according to your climatic condition. Though millets have lot of nutritional values, its known to increase body heat. Hence, moderation in consumption is recommended, especially during summer.